The Coastline Hotel is situated on a gentle slope overlooking the Salina Bay, it is a short walk to St. Paul's Bay and the town of Bugibba. Wi-Fi is free. Rooms are spacious and have a seating area. Located in Bridgetown, Bellevue Plantation offers a house and cottage with a shared outdoor swimming pool surrounded by tropical gardens. Free Wi-Fi is available throughout. The Huntingdon Marriott is a modern hotel located within four kilometres of Brampton Golf Course and within 29 kilometres of historic Cambridge. The 156 guestrooms are decorated in soft neutrals with richly patterned fabrics while amenities include high speed Internet connections, televisions, desks, minibars and tea and coffee facilities. Located just 15 minutes from Walt Disney World and 20 minutes from Universal Studios Theme Park, this resort features 3 water slides, 2 tiki bars, and suites with cable TV. Situated in the heart of Edinburgh, The George Bridge Apartments offers single beds in an apartment with a fully equipped, modern kitchen and 2 bathrooms One of the bathrooms has a jacuzzi, and towels and linens are provided. Best Western Kenwick Park Hotel is a 3 star accommodation in Lincolnshire. Set within 320 acres of beautiful grounds, the hotel is ideal for business trips, family vacations, golfing holidays and relaxing days with friends. The hotel offers 34 en-suite bedrooms with free Wi-Fi internet in a stunning location. The Best Western Cresta is a modern hotel located in Altrincham, 500 metres from the station for Metrolink trams, buses and trains to Manchester city centre, eight miles away. The 136 guestrooms have light decor with coordinated patterned fabrics. Amenities include televisions, direct dial telephones, desks and complimentary tea/coffee making facilities. All rooms have private bathrooms and hairdryers. With a modern health club and a open kitchen style grill restaurant, Village Urban Resort Manchester Cheadle offers stylish rooms with free Wi-Fi. The hotel is a 20-minute drive from Manchester city centre. 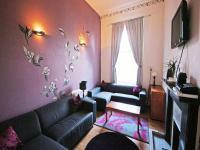 Overlooking Clapham Common and just 300 metres from Clapham South London Underground Station, this carefully restored Victorian building offers free Wi-Fi and great-value en suite rooms. Hilton Leeds City hotel is centrally located in Leeds' business and shopping district, adjacent to the city's main railway station and one kilometre from Tetley's Brewery Wharf. The hotel's guestrooms all include air conditioning, satellite television with pay movies, games consoles, Internet connections, tea and coffee making facilities, desks and trouser presses. En suite bathrooms include hairdryers and toiletries. The Park Hotel is located in Barnstaple, Devon, half a mile from the town centre, eight miles from Saunton beach, and 10 miles from the historic Arlington Court. Barnstaple train station is one mile from the hotel. Hotel Features. This modern hotel is situated opposite Rock Park in a quiet corner of the bustling market town of Barnstaple. Amenities include 24 hour room service, complimentary parking, and wireless Internet access. Makeney Hall Hotel is a magnificent Victorian country mansion, situated in the heart of Derbyshire, just 8 miles from Derby and 2 miles from the flourishing market town of Belper. Makeney Hall is set in 6 acres of beautifully landscaped gardens and provides breathtaking views across the Amber Valley. 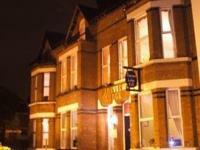 The Gower House Hotel offers rooms with free Wi-Fi and is well-placed in central London's elegant Bloomsbury area. It is set opposite the famous Royal Academy of Dramatic Art, and about 5 minutes' walk from The British Museum. The Coventry (Binley/A46) Premier Inn has incredibly comfy beds, an on-site T.G.I. Friday's restaurant and a location close to the M6 and M69. The hotel has free on-site parking and is very near to Leofric Business Park and Binley Industrial Estate. The 5-star Olympic Palace Hotel enjoys a prime location in Ixia, only metres from the beach, while at a distance of about 5 Km from the city of Rhodes and 12 km from Rhodes International Airport. A euro 4.3 million investment has transformed burn hall hotel into a high quality hotel /unveiling high specification bedrooms/ an excellent restaurant/ two bars and a new conference suite. set amidst 8 acres of attractive woodland grounds/ this victorian mansion house is surrounded by the beautiful north yorkshire countryside. burn hall hotel is just 11 miles north of york on the a19 and 13 miles south of thirsk. 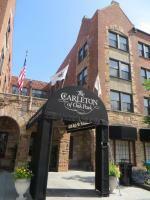 Less than 5 minutes' walk from CTA Green Line trains and the Oak Park Metra station, this historic hotel features guest rooms with flat-screen TVs and free Wi-Fi. The hotel boasts 2 restaurants on site. This top-class bed and breakfast in Belfast has been recommended for a long time by famous travel guides. Parkview Lodge rests 2 kilometres from Belfast city centre, which is 5 minutes away by bus or taxi. The Premier Travel Inn Heathrow in Hounslow, England, is a large, modern hotel located two kilometers from London Heathrow Airport. The hotel is off the A4, which offers direct access to the M4 and M25. Central London is 25 kilometers from the hotel. Hotel Features. The hotel lobby at the Premier Travel Inn Heathrow features clean, modernistic lines with beige accents on the walls and light blond wood furniture. Surrounded by lush forests, Alize is 350 metres to the Belcekiz Beach. It has an outdoor pool with a waterslide, spa facilities and air-conditioned rooms with a satellite TV and balcony. The rooms at Alize Hotel Oludeniz come with a minibar.